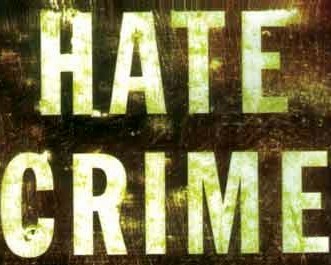 Data for 2008 on hate-motivated crime: Police services in Canada reported 1,036 hate crimes in 2008, up 35% from 2007. Just over half (55%) were motivated by race or ethnicity, 26% by religion and 16% by sexual orientation. All three major categories of hate crime increased in 2008. The largest increase was among those motivated by sexual orientation, which more than doubled from 2007 to 2008. Hate crimes motivated by religion increased 53%, while those motivated by race or ethnicity increased to a lesser extent, up 15%. Violent crimes, mainly assaults and uttering threats, accounted for 42% of all hate crimes. Mischief offences such as vandalism to property accounted for 47%, while other non-violent offences comprised the remaining 11% (Police-reported hate crimes). Criminal Code of Canada: Hate Provisions – “Hate” is defined as a crime under two parts of Canada’s Criminal Code: sections 318 and 319. To convict anyone under the Code, very specific proof is required: both of the criminal act itself, and of the intention or motivation to commit the crime. It isn’t enough that someone has said something hateful or untrue; the courts will only find someone guilty if they contravened the Code exactly, and if they did it deliberately. In most cases, hate propaganda communicated through the Internet is an offence under the Criminal Code. Amendments to the Code, made under the Anti-Terrorism Act in December 2001, further clarify measures and offences regarding Internet hate crimes (media-awareness.ca). Hate crimes (also known as bias-motivated crimes) occur when a perpetrator targets a victim because of his or her perceived membership in a certain social group, usually defined by racial group, religion, sexual orientation, disability, class, ethnicity, nationality, age, gender, gender identity, social status or political affiliation. “Hate crime” generally refers to criminal acts that are seen to have been motivated by bias against one or more of the types above, or of their derivatives. Incidents may involve physical assault, damage to property, bullying, harassment, verbal abuse or insults, or offensive graffiti or letters (hate mail) (Wikipedia). 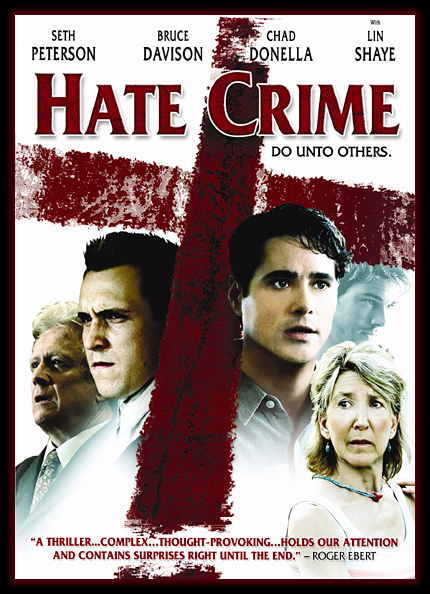 Credits: Director: Tommy Stovall; Writer: Tommy Stovall; Cast: Seth Peterson, Bruce Davison, Chad Donella, Brian J. Smith, Cindy Pickett (Hate Crime (2005)). Accomplishments: 2005 Breckenridge Festival Best Director – Tommy Stovall; 2005 Breckenridge Festival Best Supporting Actor – Chad Donella; 2005 Breckenridge Festival Best Supporting Actress – Lin Shaye; 2005 Dallas Out Takes Audience Award Best Feature Film – Tommy Stovall; 2005 Fort Worth Gay and Lesbian International Film Festival Audience Award Best Feature – Tommy Stovall; 2005 Q Award Best Debut Film – Tommy Stovall; 2005 Rhode Island International Film Festival Second Prize Best Feature – Tommy Stovall; 2005 Sedona International Film Festival Audience Award Best Feature – Tommy Stovall; 2005 Director’s Choice Award Festival Favorite – Tommy Stovall (Awards for Hate Crime (2005)). Film Review: Some painful, personal issues compelled former Londoner Ebony Tay to make the movie Hate Crime. “Being a woman and a person of colour, I understand what it’s like to be the victim of prejudice,” says Tay, producer and music composer of the film that will have its Canadian premiere screening at Rainbow Cinemas tomorrow night. “And another strong motivation was my brother-in-law’s death,” she adds. The brother-in-law is Tay’s reference to her gay brother’s partner, who committed suicide in Toronto a few years ago. “When this young man announced his sexuality to his family and friends, they all turned on him,” she recalls. “He ended up losing his mind and taking his own life. It was an awful tragedy.” The horrific impact of intolerance is among the social themes probed in Hate Crime. – Noel Gallagher, Aug 2006 (‘Hate Crime’ tackles tragedy).